I am really looking forward to this interview, Mark is a real whisky legend, releasing podcasts, when most of the world didn’t know what podcasts were. So as nerve racking as it is to interview the interviewer, it’s exciting too. Find WhiskyCast online or follow Mark on Twitter @Whiskycast. Hi Mark, how does it feel to be the interviewee for a change? It’s a change of pace, I’m used to being the one that asks the questions so it’s a real change of pace. I don’t do many interviews, I try not to, as WhiskyCast is the story and it’s about far more than just me, it’s a family business, my wife (Christina Philburn) takes care of the business and marketing, as Christina’s background is marketing. For people that might not know you, tell us a little about yourself? My background is in journalism, I’ve done radio and television all over the US, from the Midwestern Illinois and to Alaska and New York, about ten years ago, the company I was working for, I produced all their broadcast content, we talked about podcast. I thought that I was producing this so they let me play around with it, so I started to experiment and decided to do a podcast on whisky. It was something I could do without it being too serious, and something that I enjoyed. Finally I took my audio gear to Whiskyfest and set up some interviews, I spoke to people on whisky forums and asked if they would listen to podcasts, they always asked what is a podcast? I said it’s a radio show that you don’t need a radio to listen to and people were interested. Does running WhiskyCast with Christina add another dimension to the business? Christina worked in media, and will often step in and keep me in check, it’s easy for me to get caught up in what I’m doing and the passion of it, that I might not always think about the longer term. Christina and I met in radio and with Christina having that background, and that knowledge it’s really helped to drive the business. 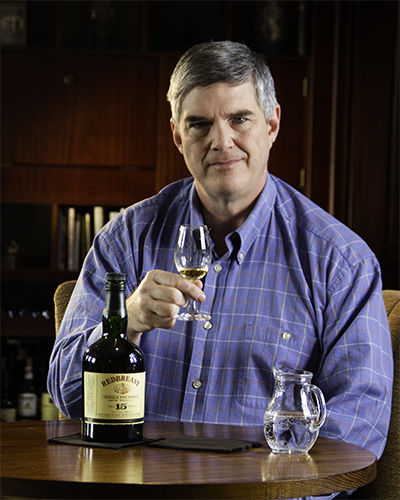 It took WhiskyCast from being a hobby to being a business in its own right. it’s really helpful to have somebody there to give you a second check, especially somebody that knows and cares about the business as much as Mark does. We know if something is right for us or not, I can be objective and maybe ask Mark to reword something, especially in the script. (Mark admits he just sometimes gets carried away and would maybe be a bit more forthright then he would perhaps want to be). I think the reason that we have been successful is people endearing themselves to the podcasts, it’s that which has charted Mark’s whisky journey. People become so involved and so passionate, there are many that have followed Mark’s journey from the very beginning, and they can follow it from start to finish. Sometimes I need to make sure that Mark isn’t forgetting the newcomers to the Podcast though, when Mark started, this was a hobby and he was very much an amateur, now Mark’s knowledge has grown and grown, it’s very easy to use a lot of industry jargon and presume that everyone who is listening has the same knowledge, however that isn’t always the case. The great thing with WhiskyCast is that you can pick it up at any point, but you can also go back in our history. Every single month when we review our download statistics, we still have about 350 downloads of the first couple of episodes and that’s very rewarding. When did your love for whisky begin? It was the fall of 1997, I was in Florida handling my grandmother’s estate and was hanging out in the evenings in a place called the Tasting Room, it was a half wine/cocktail and desserts bar and then half a liquour store. It was nice and quiet there I could eat there in peace and then one night they had a flight of single malts, for $15 so I decided to try it and see if I could learn to like it. I knew I wasn’t going to be a wine geek and beer is good but I really wanted to know what else was out there. The presenter was fantastic and he took me through a flight of the regions, I could pick out the differences right away, and just “got it”, and I knew that I liked it and could love it and really learn about it. I lived in Alaska at the time, and I bought a three back of Balvenie miniatures and brought them home, and that’s where it all started. When did you realise you could turn your love of whisky into a career? I started the show in 2005 and it was just me going down to the basement doing everything and it was just a hobby. There was no advertising and I funded it purely from my day job. In 2006 I lost my job, as I was no longer required and that was the first of the two layoffs that lead to WhiskyCast really taking off. I began a second job and I produced WhiskyCast on the weekends, and as my day job could often lead to me working late, I realised I could run WhiskyCast interviews early in the morning or the evening. I’d start taking whisky trips as vacation time. We started this as an amusement then as it became more and more serious we both started working full time on it. We lost 100,000 media jobs in the US and as mentioned I lost my job twice. So we had a meeting with the girls (Mark & Christina’s daughters) and they said if you do this you need to let mum take over the business side of this and they were absolutely right. I came on board pretty much full time and we made some changes, and made it more community friendly. We made sure the audience was out there, and that’s what we did. The most important business aspect is the community. The community that has followed WhiskyCast and grown each year with us. As we managed to get the word out about WhiskyCast and it gained in popularity we still wanted the audience to know the stories are for them, without the listeners, it’s just Mark talking about whisky. We have now grown up to 25,000 active users and over 100,000 listeners. People need to engage with WhiskyCast, as well as to listen to the podcasts, we really want their feedback and for them to feel involved, we have our facebook site as well and people often email us too. We don’t inflate our numbers (we don’t need to), we’ve never paid for readers, organic growth is what’s important, it’s this which makes the business viable. Were it not for your background in broadcasting, would you have started up WhiskyCast? No, I wouldn’t have had the expertise or the equipment or ever have had the chance to think about it. It was the 25 years of broadcasting knowledge that allowed me to do so. It takes a lot of work and a lot of resources to do this week upon week. You need to find the time to devote to this to make it work, and it evolved for us a family too, if we couldn’t make it work for us as a family then we wouldn’t have been able to continue. It allowed Mark to enjoy some more of the family life that he had so often missed out on when working, but still enabled him to work. This has made sense for us in life and it happened at the right time. We reinvented the idea of work and how it worked for us as a family. If there is something we need to do during the morning we can, and then just work later at night, if the children need our support, we have the flexibility to fit work in around us, rather than us trying to fit in around work. Both of us having independent employment made this possible, which is why it’s really worked for us as a family. How challenging was it to start podcasts before anybody really knew what they were? I’d been using podcasts for a number of years, really right from the start due to my line of work. I asked a lot of whisky people about podcasts and if they would listen to them and almost everybody would ask, what a podcast was. It’s fortunate that people were getting more immersed in technology, the advent of the iphone, tablet etc helped with that. Once people understood it was no different from a radio show really, you just didn’t need a radio to listen to it, and that if you couldn’t listen to it at the time, you could simply download it later people really came on board. How hard was it to grow the business, to develop the audience, and to bring the brands etc on board? The timing for us was very fortunate, it was a right time and the right place, there was just starting to be a healthy amount of interest in whisky, and, as this got bigger we already had the contacts, and the resources to keep the quality of the production and the business ethics. Word of mouth seemed to really take over and with that we picked up more and more listeners, people liked Mark’s style and they enjoyed learning alongside him, and a lot of our listeners have excellent knowledge now, where they maybe started out with nothing. What’s the biggest challenge you’ve faced over the years? Getting the advertising sorted was the biggest challenge, with Christina and I working full time on WhiskyCast we needed to finance this, in late 2007 we had the deal with Laphroaig, with the calendar of events, and after that more offers came in. Arranging advertisers that fit and understand our ethos, and understand that it doesn’t matter how much they sponsor us, we still retain full editorial control isn’t easy but luckily Christina is excellent at this. This year see’s WhiskyCast celebrating its 10 year anniversary, when you started this, did you envisage it would last so long, and grow so large? At the time no, to go from hobby to a viable business that we both love and that people react so well do is fantastic, we could never have imagined that ten years on we would still be going strong and that Christina and I would be working on it full time. We are really grateful people took it to their hearts the way they did. There has often been a lot of talk, about WhiskyCast being sponsored, and accusations regarding impartiality, how much does that affect you? Firstly, if we didn’t have advertising we would have finished a couple of years ago; and secondly our advertisers have no say in content whatsoever, we take suggestions from them as we do our fan base, but it takes no more precedence than anyone else. An example of this is about a month and half ago, the attorney who filed the claim against Maker’s Mark was on the show to give an interview and his side of the story. Maker’s Mark had just signed up as one of our advertisers, if we were only interested in our advertisers we would never have interviewed him, we suggested to them that they might like to have someone represent them, but they chose not to, although they had no issues with the interview. In America it’s very common place for programmes, news etc to be sponsored, although as this doesn’t really happen in the rest of the world, people find this quite surprising and then think it must compromise the ethics of the show. There’s advertising in all aspects of life, however as most people are listening to the podcasts on their headphones, this makes the advertising more noticeable, whereas in magazines you just turn the page and don’t notice it so much. There is a lot more “paid content” on the web than people realise, we were helping one of our children with their homework, and one of our daughters had used a resource from a website, unfortunately it wasn’t a factual website and I was pretty insistent in pointing this out, so people really need to be aware of what is paid content and what is factual and independent out there on the internet. Do you need to take any steps to ensure advertisers understand your impartiality? If we receive feedback that some of the advertising sounds like an endorsement from us, we go back to our sponsors and either ask to change the wording of the advert or have someone else read it for us. Our sponsors are pleased that we have such strong ethics, it makes us mean so much more to them. If an advertiser was insistent on the original wording of an advert, yet we felt it would compromise us, then we would refund them and turn them away. We mentioned about Johnnie Walker bringing back Green Label, but it was one that I had never tasted and had no notes on, and although they are a brand partner, I couldn’t get a sample from them, so I bought a bottle myself. It’s not the case that we can just get free whisky whenever we want it, even if people presume we can. Is it only the larger distilleries that you work with? We recognise that not everybody is owned by a major company with unlimited budgets, and there are smaller distillers that may well be the next big thing. We try to make sure smaller brands can have opportunities for advertising as well, it’s about trying to make a level playing field. Forty Creek signed on when they were young and now they’ve become more successful and now don’t need to be placed as a small business anymore and have changed their advertising accordingly. It’s nice to see businesses grow alongside us. I’m sure you are aware, there seems to be some rumblings that reviewers/bloggers can’t be independent if they have ever received a sample, what are your thoughts on that? I would ask the question. What about the fact that movie reviewers go to free screenings, theatre reviewers go to special previews, yet nobody questions their reviews, why not? I didn’t go into this to just to receive free samples, but if I didn’t have them I couldn’t do the reviews, there aren’t many people out there that have the budget to buy every single new bottle of whisky going, I have paid for plenty of my own bottles and reviewed them, but samples too have a place, this does not mean that I would say I love a whisky, even if I didn’t, just because it had been sent to me. Most of the samples that go out to bloggers/website owners are sent directly from PR Agencies, so it’s very rare that the distilleries themselves even know who has them. Most of these agencies then aren’t checking if people have reviewed them or not, so what would people gain from a positive review just for a free sample. People aren’t stupid, it’s very easy to see who puts time and effort into their tasting notes and who doesn’t. We also try to help people that are starting blogs and who contact us asking for help. There is no governing body for whisky writers, so we are all responsible for our own actions, although a code of ethics would be useful, it would detract from the questions about impartiality. What are your thoughts on the growing tide of bloggers, do you think they are a valid part of the whisky world? Absolutely, anything that extends the conversation and brings more voices in, grows the community, and that’s what whisky is, or should be, a community. Right now whisky is where wine was about 20 years ago. When I started WhiskyCast there was only one or two magazines or websites. Wine journalism had only a few magazines, but now wine has really exploded. The whiskysphere is really in its infancy and it is ok to write about whisky without being an “expert”. Bloggers have the right to their own opinions and can give any opinion they want, for us we don’t have that, there are some times we have to keep our own opinions to ourselves or maybe temper our thoughts a little (not often in my case, however). Sometimes I wish I could say what I want, or express myself if I have an issues with a particular thing that has exploded in the whisky world. In that sense bloggers are completely impartial and terribly honest. If bloggers really worried about free samples they would sit there and keep quiet, and whilst there may be some that do, there are plenty out there that don’t. As long as the blogs have editorial ethics and opinions that should be all that matters, and if that is something that the people reading the blogs or the websites aren’t able to see for themselves I’d question why that is? We will keep growing, the whisky university will be out this year, and this has been a real challenge for us with lots of hard work. We are really excited about this. In the next couple of weeks we will announce our plans to celebrate our ten year anniversary. We will keep working, upgrading equipment, we’ve just upgraded our webhosting service as we used all of the company’s bandwidth. We have a few ideas that we want to play around with. For the long term viability of the show we have needed to change some things around. We want to become more interactive. We really wanted to connect not only to the community but to connect the community with each other, and we hope to be able to really bring this in. There aren’t going to be major changes, but more of a depth to WhiskyCast. When the WhiskyCast University launches it will be an iBook and more in tablet format and we want to look at our mobile app too. One of the things I’m looking at is the periscope app on twitter, you need a good internet connection for that and Wi-Fi but it could let us develop live video feeds to twitter for 24hours. This opens up a lot of potential options. We also enjoyed having a video whisky tasting and we may do that again. What are the biggest changes you’ve seen in whisky industry over the past ten years? I think it’s the renewed emphasis on using really good wood, some of the older whisky they used whatever wood was there and mostly got lucky with the older casks. Bill Lumsden and Jim McEwan have experimented with wood and finishes and an obsession with making good whisky, and something unique, but not just a gimmick. It’s good to see a lot of whisky that only went to blending is now being released as a good quality single malts. In the States we are seeing some Crown Royale being released as a limited edition expression, which came out of something that was derisively called brown vodka, but these whiskies are good. I love good blends too, and I love good single grain whisky. I really wanted to bring back a 12yo Strathclyde single grain from Chivas but didn’t make it. I’d like to do a blind tasting with Haig Club and Cameronbrig and let people understand the difference. There is a real misnomer and a push, that whisky is being driven by marketing rather than the master distillers, they feel that woman need to be introduced to whisky via a bleached version of whisky, and they are doing women a disservice, if a woman is going to get a whisky then they will get it. Anybody buying into the diluted products are only going to do so for a limited period. It’s all about education, woman like more information and this is a new concept for the whisky industry, I think pairings etc are likely to have more success if they work with information. Women in whisky is not a new concept, if you go back over time women made whisky back in Scotland by home brewing as much as men did. Just how much time do you spend on WhiskyCast and whisky in general a week? About 60 hours a week, I start on Saturday evening editing and recording the show, and there’s work within the week also. In reality there isn’t much time that one of us isn’t working on something to do with whisky, we always have our phones, and therefore, we always have access to social media. We’ve never missed a show, even during times of personal hardship and bereavement. How hard do you find striking the right work/life balance? We have great flexibility and that’s a gift and that’s made it work for us, we can move our personal and professional lives around our schedule. There’s only about a two hour period in the house when somebody isn’t awake, time can be so fluid. I don’t always travel so I can undertake chores around the house and then fit my work around that. September is always a busy month, and it can be tough sometimes, as we don’t see much of each other, one year we only saw each other for about 48hours. Last April we only saw each other for three days, but we have the rest of the time where we can spend a lot of time together. Travelling can take a toll, but the payoff is so great that it transcends being a problem. What inspires you to keep working so hard? The people, the emails from listeners, when I’m at a whisky festival and people stop and thank me for the work we’ve put in and what we’ve taught them. A listener once took the time to write an email when his father had passed away, and the email was so poignant, as it explained how he and his dad had bonded over whisky. We know it really means something to people and that it’s forging a real community. We made a best friend, via an email from someone in Philadelphia, he invited me to a whisky tasting in his house and he said that he would really love me to be there. Through that he has become a good friend and a business advisor. When any of the community members email us and ask to get in touch then we invite them over and pour them anything we have. That’s lead to great conversations and friendships. We are happy to open our home and share what we have, it’s our way of thanking them for being part of our community. Do you have a favourite moment, or a moment that will always stand out since WhiskyCast started? From a personal point of view I think the one that was an argument between us, and it was the argument when I said that it if Mark wanted to continue doing this, it had to change, it had to evolve and become a business and Mark tried to fight against it, but it was when we realised it had to go from hobby to business, this was a career and to be more successful we had to use all of our talents together. I knew this because I saw some emails from people that let us know they were listening and the community wanted WhiskyCast to grow. Who is your favourite interviewee? I have many favourites, but Jim McEwan is my favourite interviewee as once I ask a question, he will usually ramble on for a good five minutes, until he pauses for breath and I can ask another question, and Jim knows this. I really want to talk to some of the older people, which work behind the scenes. I’m doing the distillery tour with Benromach and I am doing a tour with the people that are working there, and seeing how much pride they take in their work, is something special. I remember asking somebody once what was it like when you saw one of your bottles available in duty free, to see the reach that whisky has. Whisky has an amazing story, and creates so many new stories. I have to ask you, what is your favourite whisky? I haven’t found it yet, I keep looking thought. If I could only drink one whisky forever, I don’t know what it would be. If it’s a chilly night I’ll head for a Laphroaig, I also really love Redbreast and although this might sound like I’m plugging my sponsors, we actively seek out distilleries we like to work with us. Barry Crocket legacy is my favourite whisky for a celebration, and that was what I got as a mother’s day present. I’ve not tasted as much whisky as Mark as I’m not as big a drinker, I do use whisky a lot in cooking though. So, what’s going to be the next big thing in whisky? Hopefully not flavoured. It’s easy to say craft distillers, but I think it will be more global distillers, there are new distilleries popping up everywhere, the next twenty years will be amazing for whisky. You must have many anecdotes, will you share one with us? Five years ago I was at Caol Ila on the Monday of Feis Ile, I looked down at a little three year old girl, with a bag full of homemade tablet, and Chloe said that her daddy wanted me to have some of this tablet, so she took me over to meet her family and she could already recite all the Islay distilleries, and on the last day at Ardbeg, she sang Loch Lomond for me and I used it to close out the Feis Ile show. It was a really special moment for me. One our listeners turned Chloe’s recital of the distilleries into a ring tone. It really shows how friendly this industry is. Almost everybody I’ve met it so friendly and so willing to impart their knowledge. I would rather to do this than anything else. I’ve had offers to go back to the news room and cover depressing things, and I keep turning it down and keep doing what I love. We had a lady that lived across the street, and she is about 89 now, we would wave if we saw each other but aside from that I didn’t really know her, she nursed her sick husband and was a busy woman, one day we made a May basket (Christina really is as lovely as she sounds, this is a traditional basket of goodies that you take to neighbours and the elderly) and I took one over to her, and we got talking. One day I invited her over for tea, we were chatting and once she finished her tea, she said that was lovely but asked for something stronger, I thought she was referring to the tea, she said no, something more Irish. I still hadn’t got the message and said that I thought this was Irish breakfast tea already, she laughed and she asked for Irish Whiskey, and so we drank some together. It’s a great memory. I went to Home Depot and as Mark was away on work I decided I had free reign, so I decided to figure out a storage solution as I was so fed up with tripping over whisky bottles everywhere I went. I decided to go old school, get concrete blocks, heavy duty 2×4’s as a temporary solution. I asked the guys in the store to help me, so I asked someone which of these hardwoods would hold 500lbs and how many concrete blocks would I need? They asked what I would be holding, and I explained that it was whisky bottles and we had a whisky business. A few contractors were listening and in the end I had 7 guys drawing up plans and helping find a solution. Mark, thank you so much for sparing me the time for this interview, it has been fantastic to talk to you, a real pleasure and a genuine honour. Christina thank you so much for becoming involved in the interview as well, it was really great to have your input too! So here’s to the next 10 years of WhiskyCast, and catching a dram with you both next time you’re back in Scotland.